Went to the National Museum of Wildlife Art in Jackson, WY today. Saw paintings by Kuhn, Bateman, Clymer, Bierstadt and others. Two years ago I would not of had as much appreciation for them as I do today. Processing daily along with paying more attention to light and movement has allowed me to grow as an artist and appreciate museums and art galleries more. Today's image is from inside of the museum. 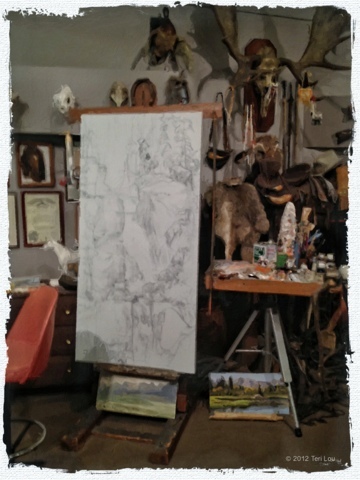 It is John and Doris Clymers Studio. I decided to give it a ArtisticOil process for the fun of it.